Article originally published in the Summer 2015 Garbanzo Gazette. A familiar proposal to all of us, and one that I will always welcome wholeheartedly. Whether it means grabbing a pick-me-up to gossip with a coworker, getting to know an admirer, or reacquainting with a long-lost friend, there is always something to look forward to—sharing stories. Although we don’t consciously think about it, sharing a cup-o-joe with someone is more than meets the eye. We bond over this delightful beverage that so many of us have come to worship. We chat between savored sips, rehash experiences, and welcome others to open up. In reality, no one wants to stand around a water-cooler; the coffee pot is the real point of congregation. Coffee is a symbol of warmth, hospitality, friendship, love, and the act of sharing. Sharing our resources, our experiences, our intimacies, and our lives— in whole, our stories, and thus ourselves. A cup of coffee is a vessel for storytelling, allowing us to open ourselves and share our memoirs and adventures with those whom we share our favorite brew. What many don’t realize is the tale that your coffee can share with you. Who better to tell Big Water Coffee’s story than former journalist, Owner and Director of Wholesale, Jason Reichel. Just recently the business made the switch from a family-run business to a worker-owned cooperative. The decision for this transition happened in a hurry. As the previous owners, Danielle and Jon, were preparing for the expansion of their family with a third baby on the way, they decided it was time to move their lives in a new direction, making room for new adventures. 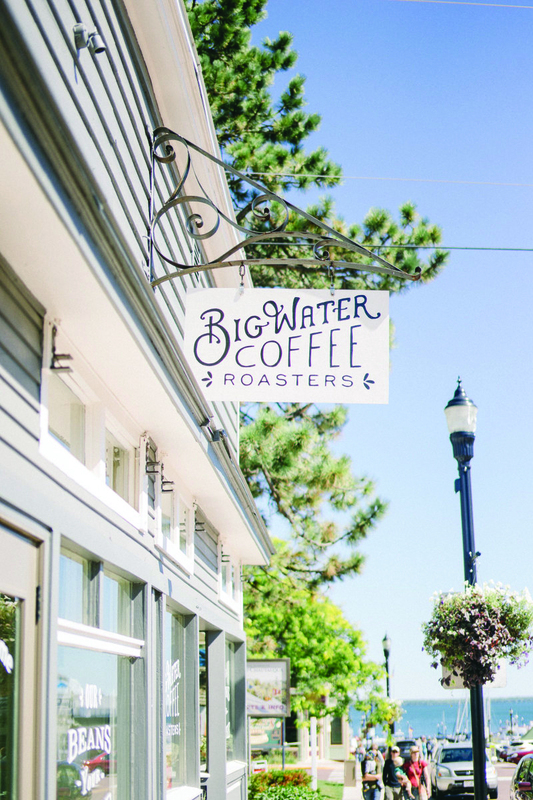 They called the employees together to discuss the future of Big Water Coffee, and ultimately realized that the cooperative model was the best fit to achieve their goals and align with their values. Since March, Jason, together with Café Managers Jim Homann and Joe Defoe, has been cooperatively running Big Water Coffee Roasters and Cafe. 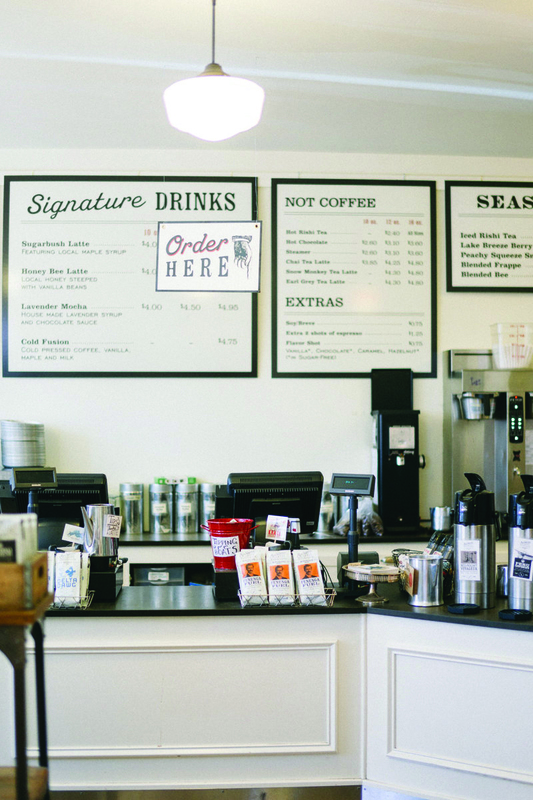 The business has a storefront in Bayfield, where patrons rave about lavender mochas and a variety of fresh-from-the-oven baked treats. In the same location lives the wholesale roastery, producing delightful smells for café-goers, and keeping the owners plenty busy. Their coffee is currently being sold in Wisconsin, Minnesota, and Michigan. At WFC you will find their beans in the bulk aisle, and can enjoy a premade cup in the deli on Wednesdays and weekends. When asked about the roasting process, Jason says, like any good story, roasting quality beans comes down to relationships and love. “Coffee roasting, like all culinary processes, is a result of constant experimentation, trial-and-error and well… love. When dealing with a sensorial process, you have to love what you’re doing! It’s also about relationships.” The roaster has an outstanding relationship with their Minneapolis-based importer, Café Imports, who ensures they receive the best green coffee available. Additionally, switching to the cooperative model has given the business the opportunity to better engage with other co-ops in the Midwest and beyond, creating relationships that weren’t previously possible. It’s apparent that BWC isn’t afraid to be outside the box. Their quirky graphic design mixed with creatively titled coffees set them apart. 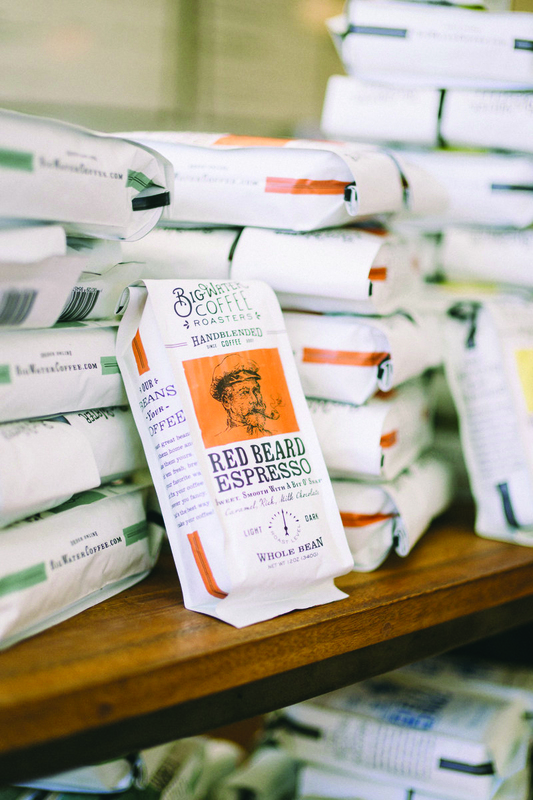 My personal favorite blend is their most classic­—the house blend. With the name “1332’ House Blend” and the slogan “Drink Big, Go Deep”, I couldn’t help but be captivated. “What does 1332’ mean? It’s the depth of that great big lake outside our door. We thought it only appropriate to tip our hats in our house blend to this mighty force in our lives. Thank you, Lake Superior.” -1332’ House Blend product description. Another of their most popular blends is influenced by our Great Lake as well. Named “Sea Smoke”, the package is adorned with a kraken and is described as “Koffee to get you Kraken”. The title was inspired by the mystifying steam rising off of Lake Superior in the early winter each year. “We all have a deep affinity for the Lake. Like most of the people that choose to call this area home, it is the Lake that brings unending pleasure. Consequently, we are all very concerned with protecting and preserving this resource.” The lake offers much more than just inspiration, it is an invaluable resource as well. In order to brew a great cup of coffee, you need access to quality, clean water. A deep love for the lake isn’t all that sets them apart. Jason, Jim, and Joe value sustainability and equitability, and have a whole lot of local pride. Labels for their coffees are made from pre-consumer waste from paper manufacturing by a company in Wausau Wisconsin. Their dairy is sourced from a local farm, Tetzer’s Dairy, and they work with local growers to source ingredients for their baked goods. Finished products are sold at local retail co-ops, restaurants, and grocers. Going forward, they’re looking to exclusively sell certified organic, fair-trade coffees. They’re incredibly proud to offer lifecycle cooperative coffee options. “From farm to roastery to retail (on the co-op’s shelves) our FT/O coffees are cooperative products. That’s pretty awesome!” comments Jason. Why should we, as consumers, spend the extra dollar to purchase organic, fair-trade coffee beans? The answer lives in your personal values. Every decision we, as consumers, make has an impact. By voting with your dollar, you become a supporting character in each of the lives of the farmers, the roasters, and the retailors. Purchasing organic, fair-trade coffee means that you are supporting a cooperative farm that treats their employees fairly and values nourishing the land in which they are growing the beans. It means supporting a cooperative roaster who values community, sustainability, and high quality, ethically sourced product. It means supporting your own local co-op (that’s us!) and the community in which it lives. Even though not all of Big Water Coffee’s beans are organic and fair-trade, they know the farms where the beans are grown, and choose to purchase from quality, ethical operations. “We are dedicated to sourcing and producing the highest quality coffees possible but we don’t think that consumers should be forced to choose between high quality coffee and equitable, sustainable production.” The moral here is to know where your money is going. With every purchase you make you enter someone’s storyline by impacting their life, and no matter the story, who doesn’t want to be the protagonist? 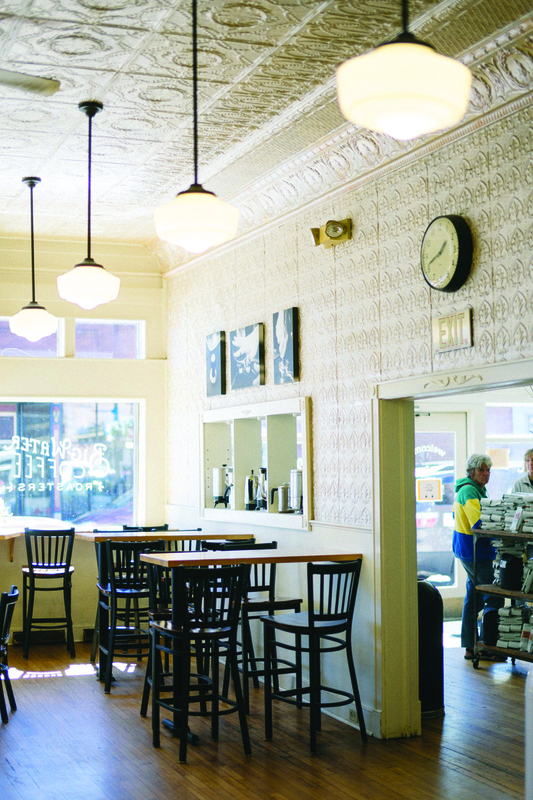 If you make your way to Bayfield Wisconsin, allow your nose to lead you to the freshly roasted beans, and start your day with a Honeybee Latte and a freshly made Maple Pecan Scone. It doesn’t end at quality beverages and delectable baked goods; the staff is exceptional as well. Jason says a prerequisite is having a true love for Bayfield and Big Water. They have to be enthusiastic about the town, and be able to keep up with the caffeine-crazed owners and tourists! If you’d like to learn more about how your beans get from the dirt to your cup, take a tour! The staff offer scheduled tours of the roastery, as well as “coffee 101”demonstrations, but they welcome impromptu tours as well, just ask! The next time you find yourself swapping stories over a good old cup-of-joe, think about how your coffee’s story fits into your own. Choose a roast that aligns with your values, and sip proudly! Although the caffeine high won’t last forever, the relationships built over warm mugs and satisfying slurps will remain. Those savored moments are what make the story worth reading.